BuzzFeed has released a detailed report on how technology is impacting it as a media company. The report reads almost as a crystal ball for legacy media companies: more than 50% of US millennials read BuzzFeed per month, according to comScore, so it’s a good indicator of the direction in which online media might be going. And for TV networks, that roadmap looks terrifying. Take a look at this chart from the report. 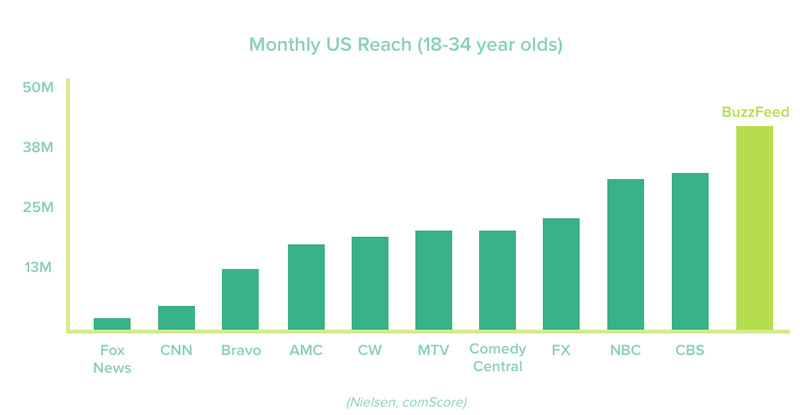 BuzzFeed’s monthly reach amongst millennials far outstrips that of CBS, NBC and FX. The trend is not as defined, but BuzzFeed is also catching up with the major TV networks among US consumers of all ages when it comes to monthly reach. There is, of course, a likely difference between a BuzzFeed viewer and a TV viewer. Chances are, a lot of BuzzFeed viewers may only spend a few minutes browsing the site, while TV viewers are more likely to settle down and be fully engaged with a TV show for a longer period. 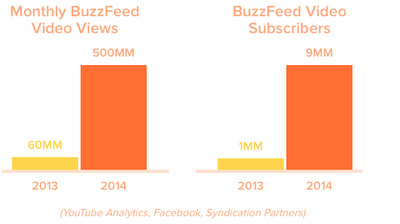 But what the charts do show is that BuzzFeed is definitely becoming a media destination among young people. Legacy media companies shouldn’t just discount BuzzFeed as a repository for whimsical lists, quizzes and cute GIFs that can’t possibly rival their quality programming. BuzzFeed is steadily building a video business in the form of BuzzFeed Motion Pictures, devoted to creating moving image content ranging from its trademark GIFs to feature films. Video is already growing rapidly on BuzzFeed, as this chart shows. 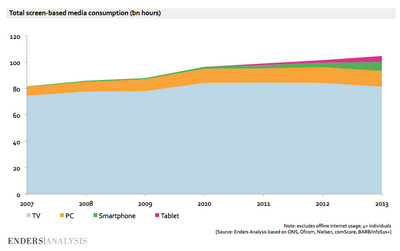 Importantly, BuzzFeed’s video business is all being built with mobile in mind. This is how BuzzFeed is rivaling TV — by playing networks at their own game when it comes to content creation, but making the distribution channel seamless via social and mobile. Unfortunately for producers and directors who live for their work appearing on the big screen, mobile is fast becoming the primary platform where videos are consumed. 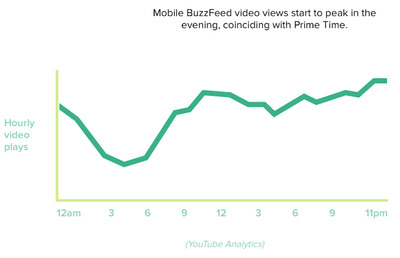 BuzzFeed says 50% of its video views are on mobile. 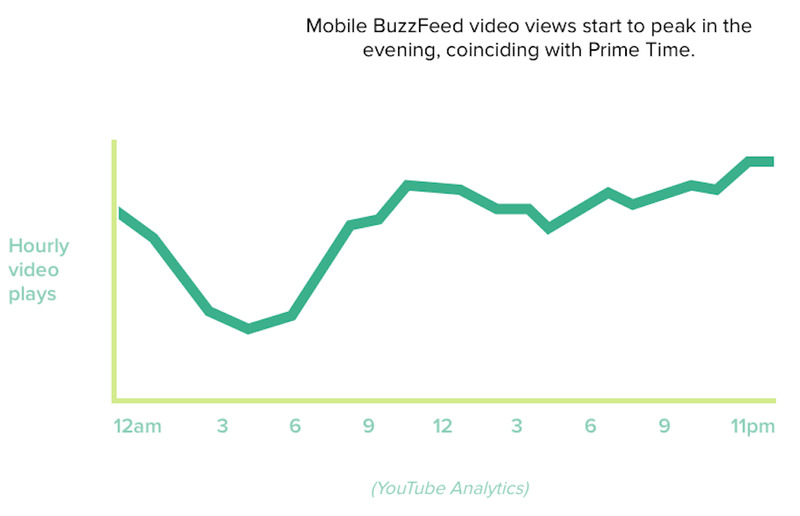 And contrary to the received wisdom that people are only watching mobile videos quickly while they commute, saving their important content consumption for the TV set when they get home: mobile BuzzFeed video views start to peak in the evening, coinciding with prime time TV. That stat doesn’t necessarily suggest millennials are watching BuzzFeed instead of the big TV networks’ hit shows, but what it does suggest is that it’s increasingly demanding their attention during the most important (and expensive) advertising hours. Chances are — although BuzzFeed doesn’t suggest this in its report — that millennials are checking out BuzzFeed during the commercial breaks. Advertisers won’t want to hear that. BuzzFeed sides with eMarketer in predicting that mobile and video will become the primary way people consume media online. 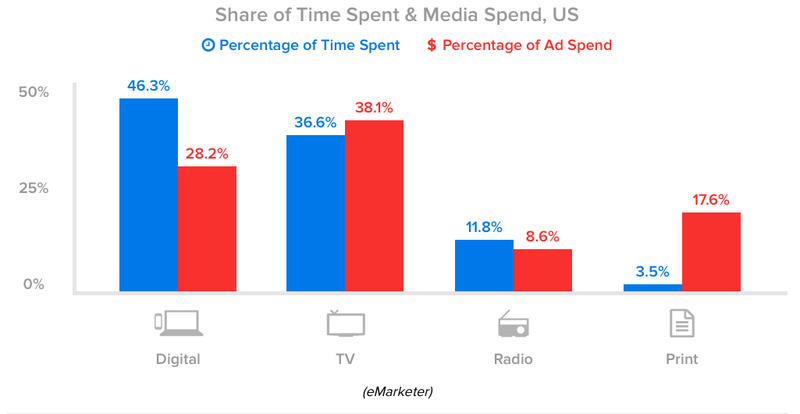 And it says that over time ad spend will become more in sync with time spent on media. Here’s how it stands now. However, it’s worth nothing that other media bodies and researchers reject that consumers are spending more time online than with TV. Many reports suggesting the demise of TV consumption are often based on survey results, and people likely understate how much time they spend watching TV. Here’s how Enders Analysis places TV versus digital consumption in the UK, for example. Still, in the case of BuzzFeed, it’s clearly a brand on the rise, building up the capabilities to become a multi-faceted media company and without the legacy complications of big TV rivals. It also claims to be “extremely profitable” and in August received $US50 million in financing from venture capitalists Andreessen Horowitz, valuing the company at $US850 million, according to a Marketing Week report. There’s lots of room to grow further. The report will also makes fascinating reading for businesses that operate primarily online. 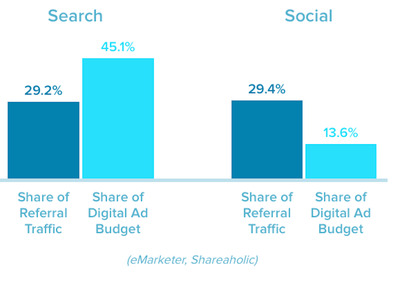 Elsewhere, BuzzFeed describes how its social referral traffic is 5X its search traffic. It wants to encourage more advertisers to consider shifting their search budgets to social if they want to engage with millennials.